CQT quantum optics group - What is this image? One day, some of us came out of the lab, probably after a long day aligning a down conversion source, probably only moderately successful because a random collection of things which like to go wrong went wrong. We concluded that a dinner was appropriate, and ended up at the "Ever success food court" just behind that Chinese Temple in West Coast Road -- a cozy spot, which in other countries would easily qualify as some sort of relaxed a beer garden. The Satay Man had brought us already some mixed satay (or even some otah if he did not run out of them at that time), and very likely we had already a sip or two of cold tiger the old chap from the drinks stall had left on our table. Many in the quantum info community have probably seen the iconic picture of the intersecting rings for a flavour of making entangled photon pairs invented by Paul Kwiat and friends in Innsbruck 1995. 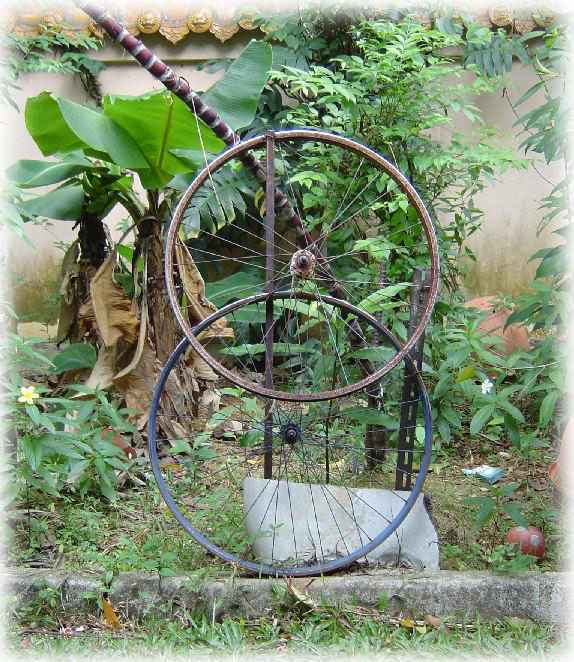 But we thought we clearly must have had too much of that tiger when we realized this bicycle wheel sculpture made by one of the local shopkeepers just next to our table....clearly it could not have been a coincidence! So from then on, we stayed with this table as a quiet cill-out place at dinner time. Singapore being constantly remodeled, of course, took its toll when some random walkway improvement wiped away this little refuge of greenery and quiet art, replacing it with a practical but sterile concrete path. The disorder and overgrown patch of soil was gone, but so was the sculpture. Things since then have become better again, a constantly increasing number of flowerpots slowly conquers back a bit of the character of the place behind the Chinese Temple - but the wheels are gone, and that bicycle shop seems to have been taken over by some other little enterprise. So what remains is this picture and our memory of the down conversion table. If you are around, have a beer and commemorate with us the unknown artist!